A new generation of thin-lift asphalt overlays called Thinlays™ are a popular approach to pavement preservation because of their ability to provide improved ride quality, reduce pavement distresses, maintain surface geometrics, reduce noise levels, reduce life-cycle costs, and provide long-lasting service. Recently, NAPA helped organize a thin asphalt overlay using warm-mix asphalt and recycled materials in Nashville, Tenn.
Tenth Street in downtown Nashville, an urban pavement with many utility cuts, was given 10 years more of life with this green (economically and environmentally) thin asphalt overlay preservation treatment. This is a NAPA instructional demonstration for those interested in asphalt paving processes and procedures. Mike Huner, then Director of Technical Services for the Tennessee Road Builders Association, is the presenter. Special thanks go to the contractor, LoJac Enterprises Inc. of Lebanon, Tenn. The Tenth Street project was completed in August 2012. NAPA has outlined the benefits of Thinlay thin asphalt overlay mixes in a 2014 position paper, Thinlays: The Pavement Preservation Tool of Choice. When used for pavement preservation, Thinlays can help agencies better manage both pavement condition and scarce funds. Thinlays can also help increase the structural capability of a roadway when used with well-built pavements. Find out why Thin Is In when it comes to pavement preservation. Thin asphalt overlays are a time-proven method for extending the life of pavement structures that are still in serviceable shape. NAPA has a full suite of materials on thin overlays in a variety of formats which can be downloaded below. For your convenience, most of these materials have been collected on one DVD, TAS-40, available in NAPA's online store. When it comes to pavement preservation, Thinlays provide trusted value for the long term. 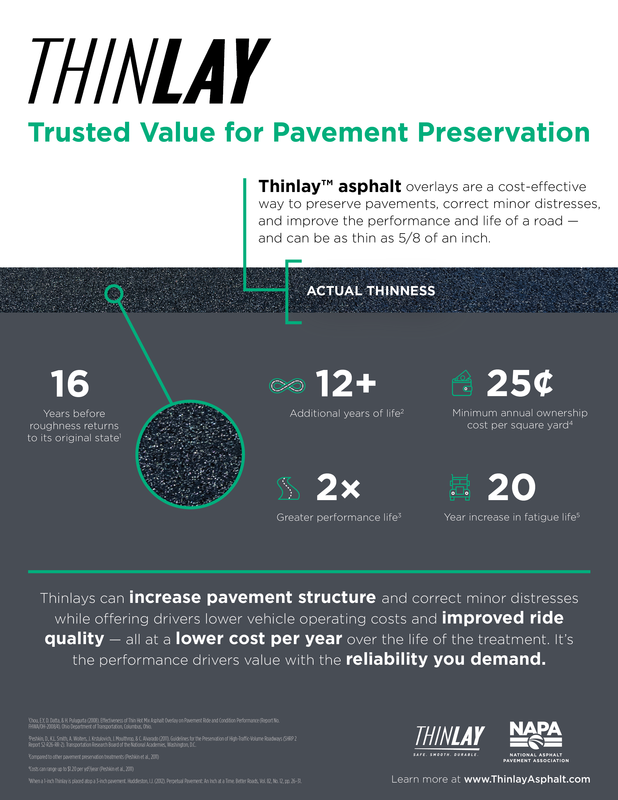 This infographic succinctly outlines how the value and performance of Thinlays delivers for road owners and road users alike. Thinlays are a popular approach to pavement preservation because of their ability to provide improved ride quality, reduce pavement distresses, maintain surface geometrics, reduce noise levels, reduce life-cycle costs, and provide long-lasting service. NAPA has several publications that provide guidance on Thinlays and other thin-asphalt overlays. IS-141, Thinlays for Pavement Preservation, discusses the use of small NMAS asphalt overlay mixes designed specifically for pavement preservation purposes, including how they fit within pavement management systems, when and how they should be used based on existing pavement condition, how Thinlay mixes should be developed and specified, and best practices for Thinlay construction. Also available is IS-135, Thin Asphalt Overlays, which provides additional guidance on when to choose thin asphalt overlays, material selection and mix design, ensuring construction and quality control, and what type of performance benefits to expect. Click here to download. An additional resource many may find helpful is NCHRP Synthesis 464: Thin Asphalt Concrete Overlays, which documents the current state of the practice (2014), as well as research efforts on the use of thin asphalt concrete overlays for pavement maintenance, rehabilitation, and preservation. This DVD-ROM compiles the IS-135 PDFs, PowerPoint presentation, and webinar video, as well as a .AVI version of the webinar video, in one place making it an effective way to pass along information about thin asphalt overlays to customers or to use as part of a training. The disc is available at NAPA's online store for only $10. From Pavement Preservation Journal, "'Thinlay' Asphalt Overlays Next Word in Pavement Preservation"
From Pavement Preservation Journal, "Texas Considers Ultra-Thin HMA Alternatives to Seal Coats"
From Better Roads magazine, "Perpetual Pavements, an Inch at a Time"
From Asphalt Pavement magazine, "New Jersey Overlays I-280 With Warm Mix"
From Asphalt Pavement magazine, "A New Hit in Music City: Thin Asphalt Overlays for Pavement Preservation"